More and more, the word neuroscience pops up in various aspects of life. Knowledge of the brain has entered the mainstream, everywhere from education to business, and even to pop culture. The Disney-Pixar movie Inside Out is just one example of how ordinary talking about the brain has become. It seems like everyone knows something about neuroscience these days. Keeping up with the new trends in employee engagement and leadership now requires a basic understanding of the brain and neuroscience. To put it simply, neuroscience is the study of the nervous system. This includes the brain, spinal cord, and all the nerves throughout the body. Neuroscience is not just about the biology of these structures, but also includes the psychology of the brain as well as the interactions between the nervous system and other body systems. Over the years, scientists have gained more knowledge about both the molecular structures of the brain and nervous system, and about the behaviors that result from them. Neurology – disorders of the nervous system and how to diagnose and treat them. Neurobiology – the structure and function of the nerves and brain. Neurochemistry – the cellular chemical processes that occur in order for nerves to function. Neurophysiology – how the nervous system responds to the external world. Neuropsychology – the interplay between psychological processes and brain function. Neuropsychotherapy – the use of neuroscience to treat psychological problems. Cognitive Neuroscience – how the brain and nervous system create cognition. Social Neuroscience – how the brain and nervous system create social behaviors. The above list is not exhaustive, but it is a quick introduction into how extensive neuroscience research is and how many fields it impacts. In terms of business, much of what is written is written about the brain. We will look at an overview of brain structures and functions, in order to get a better understanding of why and how people act the way they do. If we can understand the brain, we can have a better understanding of the behaviors of the people we work with, as well as discover ways of making the workplace a better place to be. The brain is a complex set of over 86 billion neurons, all communicating to create all our thoughts, behaviors, and functions. In order to try to organize the brain, scientists have divided it into three main sections: the brain stem, the limbic system, and the cerebral cortex. The Brain Stem is located at the base of the brain, or at the top of the spinal cord. It is often called the reptilian brain as it is the oldest part of the brain, in an evolutionary sense. This part of the brain regulates signals coming from the spine is critical for breathing, heartbeat, sleeping, eating, and other necessary aspects of life. The cerebellum is located behind the brain stem and is important for timing and coordination of movements. The limbic system is the next “layer” up, sitting on the brain stem, and is sometimes called the mammalian brain. Evolutionarily speaking, this part of the brain came into existence around the time of mammals. The limbic system is important as the emotional center of the brain. There are many other complex functions and structures in the limbic system, but we will touch on only a few of them. Thalamus – This structure receives sensory information and sends it to other parts of the brain to be processed. Hypothalamus – A link to the endocrine system, this structure controls the feelings of hunger, thirst, fatigue, and temperature. Amygdala – This structure helps in the processing of emotions, most notably fear. It also plays an important role in memory formation about pain and body reactions to the environment. Hippocampus – Often thought of as the memory center of the brain, this structure stores some memories, but mostly helps memories to be formed and stored throughout the brain. Cingulate cortex – Sitting on top of and linked closely with the limbic system, this area of the brain is important for attention and awareness of the environment. Nucleus accumbens – A series of structures sometimes considered to the reward center. It has an important role in dopamine and oxytocin. Dopamine helps reinforce rewarding behaviors while oxytocin helps to reinforce bonding and trust-based behaviors. Habit formation and learning patterns are also processed here. The cerebral cortex is the third and outermost “layer” of the brain. Many mammals have this part of the brain, especially larger mammals like dolphins, large apes, and elephants, but the complexity of the human cerebral cortex is often the basis of what distinguishes us from other mammals. The cerebral cortex is divided into four lobes: occipital, temporal, parietal, and frontal. Occipital – At the lower back part of the brain, this lobe is responsible for much of the visual processing that occurs. Temporal – On both sides of the brain, these lobes help us with abstract thinking, metaphors, and language. Parietal – Spanning a large area at the top of the brain, this lobe is important for processing sensory details and coordinated and planned movements. Frontal – At the front of the brain, this is lobe that is sometimes credited with making us uniquely human, as it controls executive functioning and emotional regulation. This all may sound a bit too abstract and you may be thinking what this has to do with business and leadership, but this is the core base of everything we do as humans, employees, and leaders. Imagine that you are a manager discussing quarterly earnings in a meeting. Outside of your awareness, your brain stem makes sure your heart beats and you are able to breathe. Your limbic system is taking in all the outside information about heat, light, people, sounds, and funneling it through a complex network to help you interpret it and react to it emotionally. Your cortex is allowing you to speak fluently and coherently, to plan for what you are going to say next, to focus your thoughts, to calm you nerves, and to respond to questions. Most of that is going on beyond awareness. All of a sudden, if there is a loud bang, your brain automatically processes the sound, where it came from, and if it is a threat. Your heartrate might increase. Your breathing may stop for a second. You will look toward the source of the sound and a split second of fear or shock may be all that you can think about. In the moments after, your cortex may start to take control and you may realize that it was an employee banging their fist on the table. You would then need to process how to respond (in emotions, in tone, in posture, in words). All this happens in parallel and in less than seconds. If you can understand the process of your own brain and how sensory information, emotions, and thoughts impact you and your behaviors, you can begin to realize how it may impact the brains of others. This increased awareness of the brain and how it functions can give you an advantage in being a better leader and creating a better workplace. 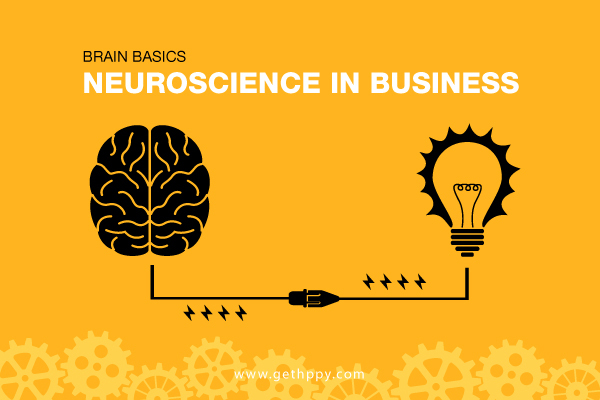 For more information about the brain and the other processes that influence business, take a look at our following article in this series on neuroscience and business: Beyond Brain Basics: 5 Neuroscience Lessons for Leaders.